We are developing sophisticated techniques for mutual adaptation is a phenomenon we believe to exist between multiple learning agents being adapting with each other. We study mutual adaptation by taking a three stage approach (Fig.1) consisting of a human-human experiment, a human-agent WOZ experiment, and a human-adaptive agent experiment. Instead of directly diving into the third stage, we observe in detail how people adapt with each other and how people improve the protocols for interacting with robots. From the human-human experiment, we proposed a two-layered model, which means mutual adaptation proceeded in stages. From the human-agent WOZ experiment, we found some useful knowledge, such that easy-to-understand gestures were often selected as mutual adaptation protocols and gesture interfaces had a greater tendency to invoke mutual adaptation. From the human-adaptive agent experiment, we revealed some necessary conditions to proceed mutual adaptation; both the human and agent have the ability to take initiative and to influence the partner, both can keep up with the change of interaction patterns and both can receive a feedback or reward from another . Fig.1: Our methodology of developing communicative robots. Yong Xu, Kazuhiro Ueda, Takanori Komatsu, Takeshi. 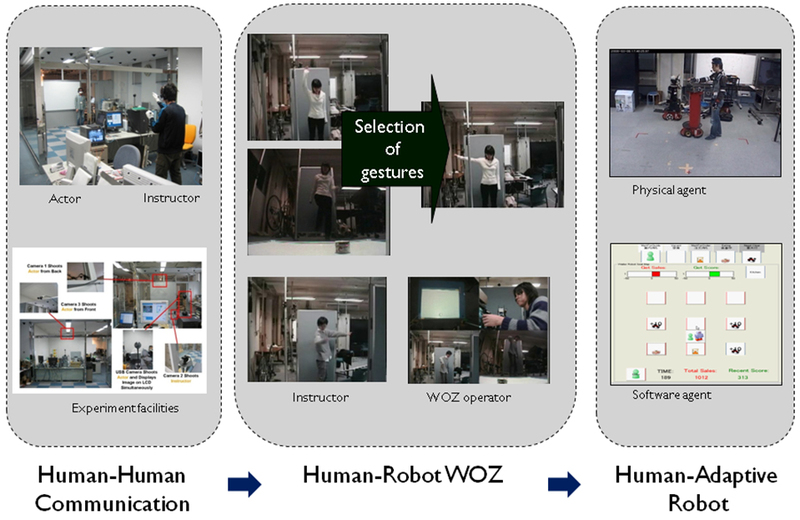 Okadome, Takashi Hattori, Yasuyuki Sumi and Toyoaki Nishida: WOZ experiments for understanding mutual adaptation, AI & Society 23(2): 201-212, 2009.